SFU Business MBA student, Julia Green, was kind enough to share her experiences at the 2011 MBA games with us. Please enjoy this entry! The time has come! After a restless sleep in our respective hotel rooms, myself, Colin, Kelvin, Matt and our coach Tim were up at 6:30 am Toronto time (3:30 am Vancouver time) in order to iron our suits and eat a good breakfast. The bus to Schulich Business School (York University) left bright an early at 8:00 am sharp. After a dozy 40 minute bus ride, we finally arrived at the Schulich campus. The case competition officially began at 9:30 am. Before we knew it, we were well on our way. The three hours spent analyzing and preparing our case presentation went by in a flash. After feverishly putting the finishing touches on our power point, and handing in our USB, we had about an hour to relax before we were officially set to present in front of the judges. The nervous energy was palpable, I could barely sit still. Finally, it was time for us to present. In one word; we nailed it. The judges asked tough questions, but we had eloquent and well-placed responses to every question thrown at us. We were confident, but aware of the caliber of the competition; top business schools including Richard Ivey, Queen’s and Rotman to name a few.? At the end of the first round, we waited patiently to hear who made the finals and were delighted to learn that Segal was one of six teams to make it through to the finals! At this point, a surge of adrenaline kicked in and the team came together to prepare for the final round of presentations. We were the last team to present to a full room of judges and contestants at 6:30 pm. The pressure was on and the judges were tough, but we managed to hold our own. Overall, making it to the final round was an amazing accomplishment for my team and for SFU. We made the top six out of 20 Canadian business schools, beating out the likes of Ivey and UBC. What an amazing and unforgettable experience. Although preparing for this case competition was certainly not easy, the experience was truly invaluable. 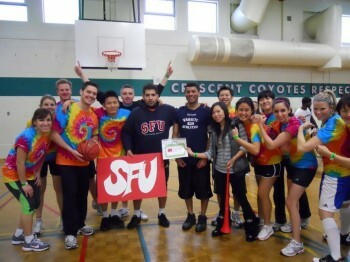 Congrats to the entire SFU MBA Games team!